Miguel Lienzo, the Coffee Trader, wants to win back both wealth and good name, but is hindered by a combination of external and internal barriers while Europe falls in love with coffee beans and their magical abilities to extent men’s waking hours and his intelligence. Miguel Lienzo, is a tireless entrepreneur tested by repeat failure. His story takes place in Amsterdam of 1659. The world’s first commodities exchange allows great wealth to be gained and lost with a single stroke of luck or misfortune, or misjudgment. Miguel, a member of Amsterdam’s tight group of Portuguese Jews, has just lost his great wealth and his good reputation. He sees an opportunity in the new rage to hit Europe’s shores: The coffee beans and their magical abilities to extent men’s waking hours and his intelligence. And so, Miguel Lienzo becomes The Coffee Trader. But his drive to win back both wealth and good name is hindered by a combination of external and internal barriers. Miguel’s desire for untouchable beauty is stroked by hints of reciprocal lust. His longing for family harmony is dashed by brotherly betrayal. His devout faith is chilled by cynical religious functionaries. His friends turn out to be enemies, and those he thought opposed him become his saviors. 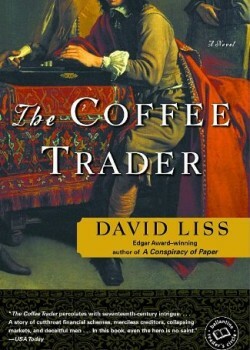 In “The Coffee Trader,” Novelist David Liss follows his “Conspiracy of Paper” with another tale of suspense and intrigue that revolve around money. He takes us into a world utterly different than ours and pulls us in until we are part of the action. You’d better set aside enough time and a large pot of dark brew so that you can read “The Coffee Trader” in one sitting, because once you started it, there’s no putting it down.